For many years, this boy's activity book was the only one that had been reprinted. It is relatively small, being only about 4 1/2 inches wide and 5 1/2 inches tall, it contains a multitude of games, magic tricks, card tricks, puzzles, and other entertainments that surely must have delighted many boys in the nineteenth century. The same subjects would cause equal delight now. Like The American Boy's Book discussed elsewhere in this list, there are some activities in this book that should only be done with adult supervision. Fencing and some of the gymnatics excercises we would think would fall in that category. Although the original was printed more than thirty years before the civil war, this book went through many printings but few revisions. Also, since books were not produced in the volume we now experience, they often were kept and read by following generations more than books today. Thus, it was still being used as a play guide into the civil war period. 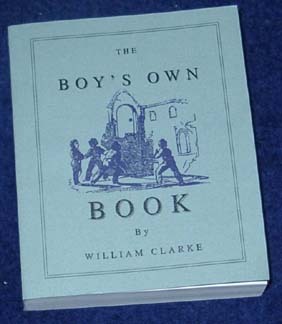 This book, too, is heartily recommended as a source of boy's activities for historic interpreters or modern children wanting to make their own fun as boys did in the nineteenth century.